JRollon has posted more render screenshots from the upcoming British Aerospace Jetstream 31/32 for X-Plane 10. Leading Edge Simulations has posted the first engineers panel render from the Boeing 747-200 project for X-Plane. Paulo Ricardo has posted new preview screenshots from the upcoming Rio de Janeiro 2012 photo scenery for FSX. UK2000 has released the Cardiff Airport (EGFF) scenery for FSX and FS2004. Details at the Product Page and SimMarket. The recently released Carenado Piper PA-34 Seneca II for X-Plane is now also available to purchase at SimMarket. - Realistic lights: Navigation lights, beacons, landing lights. - 3D modeled pilot and cockpit area. - Many details such as: pitot, antennas, chocks, pitot cover, baggage area. - Realistic textures and original paint designs. - Realistic light effects on gauges. - Real weight and balance. Outerra has posted several 3D grass previews from the Outerra Terrain Engine currently under development. 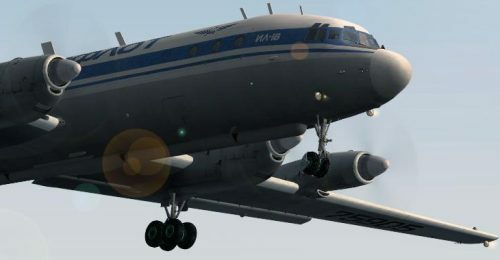 The freeware Ilyushin IL-18 turboprop airliner for FSX is now available to download at Rikoooo. Dino Cattaneo has posted more preview screenshots from the Lockheed Martin F-35 Lightning II V2.0 project for FSX. ImagineSim has released the Indira Gandhi International Airport (VIDP) scenery FS2004 (FSX version coming soon). Orbx has posted new preview screenshots from the upcoming Jackson Hole Airport (KJAC) for the FTX CRM region. Orbx has announced availability of the Migrator Tool for Prepar3D. Details and download in the Orbx Forums. FlightSim Development Group has announced the upcoming freeware Oresund Bridge and Surroundings scenery for FSX. Hervé Sors has released Navaids Update 1205 for FSX and FS2004. Available at the Flight Simulator Navaids Page. Flight1 Software has announced the impending release of the QualityWings Ultimate 146 Collection for FS2004. Blue Sky Scenery has released the freeware Los Angles - Part 2: NorthEast photo scenery for FSX and FS2004. Black Box Simulation has posted another teaser screenshot and promo video from the Airbus Xtreme Prologue for FSX. Aerofiles has released the open beta version of Brønderslev Airport for FS2004. Details at the Aerofiles Website. Emilios has posted another teaser screenshot from the upcoming Aerosoft Heraklion Intl. Airport (LGIR) for FSX. Aerosoft is offering 20% discounts on select Spanish destinations and Gibraltar. Valid through Monday May 7th 2012. Laszlo 'beczl' Becz has announced development of the DCS: Mikoyan-Gurevich MiG-21Bis Fishbed. The recently released Carenado Beechcraft King Air C90 for FSX is now also available to purchase at SimMarket. - Avydyne Multifunction display and EFIS (EADI &amp; EHSI). - New lighting rendering system. Landing, taxi, strobe and beacon illuminate objects and ground. - New 3D stereo sounds. - Knobs and switches sounds. - Original EFIS (EADI &amp; EHSI) installed. - Real behavior compared to the real airplane. Real weight and balance. Tested by real pilots. - Realistic night lights effects on panel and cockpit. ArezOne-Aviation has released the Beechcraft Kingair C90B Pratt&Whitney PT6A-21 SoundSet for FSX. Dieter Linde has posted updated Plan-G Data Files for the Orbx FTX North America - Northern Rocky Mountains region. Navigraph NAVData AIRAC Cycle 1205 is now available. Purchase Credit Packs at Navigraph or SimMarket. Lionheart Creations has updated the Aerospool WT-9 Dynamic for FSX to version 1.3 with Prepar3D compatibility. Rotorfsx from the Hovercontrol Forums has posted several renders of the Hughes 500C/D under development for FSX. Orbx has posted more previews from the upcoming Walker Airfield (OR57) and Hobby Field (77S) for the PNW region. A_A Sceneries has announced development of Kuala Lumpur International Airport (WMKK) for FSX and FS2004. ImagineSim has posted more preview screenshots from the upcoming Indira Gandhi International Airport (VIDP) scenery. Andrew Wilson from Flight Sim Labs has detailed more features of the fuel system on the upcoming Airbus A320 for FSX. Drzewiecki Design has released version 3.0 of the Polish Airports Vol.2 scenery package for FSX and FS2004. LimeSim has posted pictures from a recent tour of the soon to be opened Berlin Brandenburg Airport (EDDB). Andreas Jennerwein has released the freeware Rossfeld Glider Airfield for FSX. Download at AVSIM and Flightsim.com. The International X-Plane Engineering Group has posted more hydraulics systems information from the 737-300 for X-Plane. Taburet has released the Hamburg Photorealistic scenery for X-Plane 10. Now available to purchase at SimMarket. The Just Flight Douglas DC-6 Legends of Flight Expansion Pack for FSX is now also available at SimMarket. Dino Cattaneo has posted new preview screenshots from the Lockheed Martin F-35 Lightning II V2.0 project for FSX. The Mil Helicopters Mi-2 for X-Plane 9 and X-Plane 10 is now available to purchase at the X-Plane.org Store. Carenado has posted more preview screenshots from the upcoming Cessna CT182T Skylane G1000 for FSX. The Black Box Simulation Airbus Xtreme Prologue for FSX is now available to pre-order at the Online Store.